The K-225 was an experimental helicopter designed and built by Kaman Aircraft. While the K-225 was primarily designed as an experimental unit, Kaman did design the commercial model for agricultural use. Specifically crop-dusting. 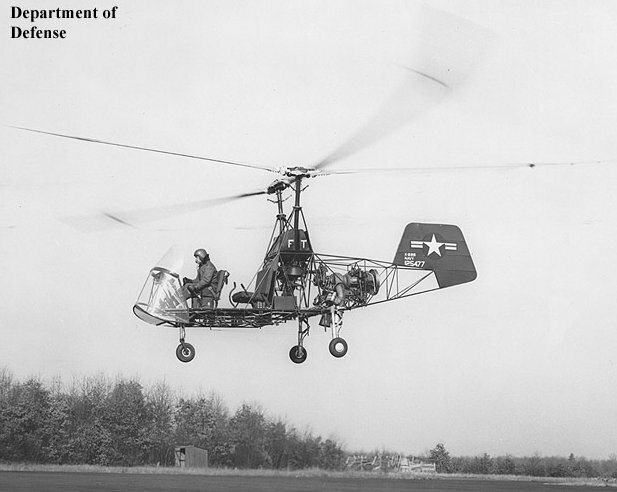 The K-225 was a two-seat tandem helicopter with twin intermeshing rotors. Its frame consisted of steel tubing and it possessed tricycle landing gear. The commercial model had a 225 horsepower engine, hence the designation. The K-225 was the third helicopter built by Charles Kaman, following the K-125 and K-190. The K-225 made its first flight in July of 1947. The US Navy and Coastguard each purchased two and one prototypes respectively, while the Air Force evaluated one under the designation YH-22. In December 1951 a modified K-225 became the world’s first gas turbine- powered helicopter. The success of this experiment is one of the main reasons that Kaman abandoned synchropters with twin intermeshing rotors. With the gas turbine engine power was “cheap” in relation to weight, so a single rotor design, which was better for naval deck logistics, now made more sense. So in a way the K225 is the helicopter that ended the synchropter trend at the time. Today the K-225 is retired with only single units purchased by the various armed forces. Of the 11 commercial units one went to Turkey, another to Mississippi and nine were leased as crop dusters as there wasn’t a buyer’s market for them. If it were not for a Naval order that included three units, Kamov may have succumbed to a financial crisis at the time. Do you want to comment the Kaman K-225 helicopter?